Quarterly report pursuant to Section 13 or 15(d) of the Securities Exchange Act of 1934 for the quarterly period ended June 30, 2012. Transition report pursuant to Section 13 or 15(d) of the Securities Exchange Act of 1934 for the transition period from to . The United States Oil Fund, LP (USOF) was organized as a limited partnership under the laws of the state of Delaware on May 12, 2005. USOF is a commodity pool that issues limited partnership units (units) that may be purchased and sold on the NYSE Arca, Inc. (the NYSE Arca). Prior to November 25, 2008, USOFs units traded on the American Stock Exchange (the AMEX). USOF will continue in perpetuity, unless terminated sooner upon the occurrence of one or more events as described in its Fifth Amended and Restated Agreement of Limited Partnership dated as of October 13, 2008 (the LP Agreement). The investment objective of USOF is for the daily changes in percentage terms of its units per unit net asset value (NAV) to reflect the daily changes in percentage terms of the spot price of light, sweet crude oil delivered to Cushing, Oklahoma, as measured by the daily changes in the price of the futures contract for light, sweet crude oil traded on the New York Mercantile Exchange (the NYMEX) that is the near month contract to expire, except when the near month contract is within two weeks of expiration, in which case the futures contract will be the next month contract to expire (the Benchmark Oil Futures Contract), less USOFs expenses. It is not the intent of USOF to be operated in a fashion such that the per unit NAV will equal, in dollar terms, the spot price of light, sweet crude oil or any particular futures contract based on light, sweet crude oil. It is not the intent of USOF to be operated in a fashion such that its per unit NAV will reflect the percentage change of the price of any particular futures contract as measured over a time period greater than one day. United States Commodity Funds LLC (USCF), the general partner of USOF, believes that it is not practical to manage the portfolio to achieve such an investment goal when investing in Oil Futures Contracts (as defined below) and Other Oil-Related Investments (as defined below). USOF accomplishes its objective through investments in futures contracts for light, sweet crude oil and other types of crude oil, heating oil, gasoline, natural gas and other petroleum-based fuels that are traded on the NYMEX, ICE Futures or other U.S. and foreign exchanges (collectively, Oil Futures Contracts) and other oil-related investments such as cash-settled options on Oil Futures Contracts, forward contracts for oil, cleared swap contracts and over-the-counter transactions that are based on the price of crude oil, heating oil, gasoline, natural gas and other petroleum-based fuels, Oil Futures Contracts and indices based on the foregoing (collectively, Other Oil-Related Investments). As of June 30, 2012, USOF held 13,918 Oil Futures Contracts for light, sweet crude oil traded on the NYMEX and 2,000 Oil Futures Contracts for light, sweet crude oil traded on the ICE Futures. USOF commenced investment operations on April 10, 2006 and has a fiscal year ending on December 31. USCF is responsible for the management of USOF. USCF is a member of the National Futures Association (the NFA) and became a commodity pool operator registered with the Commodity Futures Trading Commission (the CFTC) effective December 1, 2005. USCF is also the general partner of the United States Natural Gas Fund, LP (USNG), the United States 12 Month Oil Fund, LP (US12OF), the United States Gasoline Fund, LP (UGA) and the United States Diesel-Heating Oil Fund, LP (formerly, the United States Heating Oil Fund, LP) (USDHO), which listed their limited partnership units on the AMEX under the ticker symbols UNG on April 18, 2007, USL on December 6, 2007, UGA on February 26, 2008 and UHN on April 9, 2008, respectively. As a result of the acquisition of the AMEX by NYSE Euronext, each of USNGs, US12OFs, UGAs and USDHOs units commenced trading on the NYSE Arca on November 25, 2008. USCF is also the general partner of the United States Short Oil Fund, LP (USSO), the United States 12 Month Natural Gas Fund, LP (US12NG) and the United States Brent Oil Fund, LP (USBO), which listed their limited partnership units on the NYSE Arca under the ticker symbols DNO on September 24, 2009, UNL on November 18, 2009 and BNO on June 2, 2010, respectively. USCF is also the sponsor of the United States Commodity Index Fund (USCI), the United States Copper Index Fund (CPER), the United States Agriculture Index Fund (USAG) and the United States Metals Index Fund (USMI), each a series of the United States Commodity Index Funds Trust. USCI, CPER, USAG and USMI listed their units on the NYSE Arca under the ticker symbol USCI on August 10, 2010, CPER on November 15, 2011, USAG on April 13, 2012 and USMI on June 19, 2012, respectively. All funds listed previously are referred to collectively herein as the Related Public Funds. USCF has also filed registration statements to register units of the United States Sugar Fund (USSF), the United States Natural Gas Double Inverse Fund (UNGD), the United States Gasoil Fund (USGO) and the United States Asian Commodities Basket Fund (UAC), each a series of the United States Commodity Funds Trust I, and the US Golden Currency Fund (USGCF), a series of the United States Currency Funds Trust. USOF issues units to certain authorized purchasers (Authorized Purchasers) by offering baskets consisting of 100,000 units (Creation Baskets) through ALPS Distributors, Inc., as the marketing agent (the Marketing Agent). The purchase price for a Creation Basket is based upon the NAV of a unit calculated shortly after the close of the core trading session on the NYSE Arca on the day the order to create the basket is properly received. In addition, Authorized Purchasers pay USOF a $1,000 fee for each order placed to create one or more Creation Baskets or to redeem one or more baskets (Redemption Baskets), consisting of 100,000 units. Units may be purchased or sold on a nationally recognized securities exchange in smaller increments than a Creation Basket or Redemption Basket. Units purchased or sold on a nationally recognized securities exchange are not purchased or sold at the per unit NAV of USOF but rather at market prices quoted on such exchange. In April 2006, USOF initially registered 17,000,000 units on Form S-1 with the U.S. Securities and Exchange Commission (the SEC). On April 10, 2006, USOF listed its units on the AMEX under the ticker symbol USO. On that day, USOF established its initial per unit NAV by setting the price at $67.39 and issued 200,000 units in exchange for $13,479,000. USOF also commenced investment operations on April 10, 2006, by purchasing Oil Futures Contracts traded on the NYMEX based on light, sweet crude oil. As of June 30, 2012, USOF had registered a total of 1,627,000,000 units. The accompanying unaudited condensed financial statements have been prepared in accordance with Rule 10-01 of Regulation S-X promulgated by the SEC and, therefore, do not include all information and footnote disclosure required under generally accepted accounting principles (GAAP) in the United States of America. The financial information included herein is unaudited; however, such financial information reflects all adjustments, consisting only of normal recurring adjustments, which are, in the opinion of USCF, necessary for the fair presentation of the condensed financial statements for the interim period. Commodity futures contracts, forward contracts, physical commodities and related options are recorded on the trade date. All such transactions are recorded on the identified cost basis and marked to market daily. Unrealized gains or losses on open contracts are reflected in the condensed statements of financial condition and represent the difference between the original contract amount and the market value (as determined by exchange settlement prices for futures contracts and related options and cash dealer prices at a predetermined time for forward contracts, physical commodities, and their related options) as of the last business day of the year or as of the last date of the condensed financial statements. Changes in the unrealized gains or losses between periods are reflected in the condensed statements of operations. USOF earns interest on its assets denominated in U.S. dollars on deposit with the futures commission merchant at the overnight Federal Funds Rate less 32 basis points. In addition, USOF earns income on funds held at the custodian or futures commission merchant at prevailing market rates earned on such investments. Brokerage commissions on all open commodity futures contracts are accrued on a full-turn basis. USOF is not subject to federal income taxes; each partner reports his/her allocable share of income, gain, loss deductions or credits on his/her own income tax return. In accordance with GAAP, USOF is required to determine whether a tax position is more likely than not to be sustained upon examination by the applicable taxing authority, including resolution of any tax related appeals or litigation processes, based on the technical merits of the position. USOF files an income tax return in the U.S. federal jurisdiction, and may file income tax returns in various U.S. states. USOF is not subject to income tax return examinations by major taxing authorities for years before 2008. The tax benefit recognized is measured as the largest amount of benefit that has a greater than fifty percent likelihood of being realized upon ultimate settlement. De-recognition of a tax benefit previously recognized results in USOF recording a tax liability that reduces net assets. However, USOFs conclusions regarding this policy may be subject to review and adjustment at a later date based on factors including, but not limited to, on-going analysis of and changes to tax laws, regulations and interpretations thereof. USOF recognizes interest accrued related to unrecognized tax benefits and penalties related to unrecognized tax benefits in income tax fees payable, if assessed. No interest expense or penalties have been recognized as of and for the period ended June 30, 2012. Authorized Purchasers may purchase Creation Baskets or redeem Redemption Baskets only in blocks of 100,000 units at a price equal to the NAV of the units calculated shortly after the close of the core trading session on the NYSE Arca on the day the order is placed. USOF receives or pays the proceeds from units sold or redeemed within three business days after the trade date of the purchase or redemption. The amounts due from Authorized Purchasers are reflected in USOFs condensed statements of financial condition as receivable for units sold, and amounts payable to Authorized Purchasers upon redemption are reflected as payable for units redeemed. Profit or loss shall be allocated among the partners of USOF in proportion to the number of units each partner holds as of the close of each month. USCF may revise, alter or otherwise modify this method of allocation as described in the LP Agreement. USOFs per unit NAV is calculated on each NYSE Arca trading day by taking the current market value of its total assets, subtracting any liabilities and dividing that amount by the total number of units outstanding. USOF uses the closing price for the contracts on the relevant exchange on that day to determine the value of contracts held on such exchange. Net income (loss) per unit is the difference between the per unit NAV at the beginning of each period and at the end of each period. The weighted average number of units outstanding was computed for purposes of disclosing net income (loss) per weighted average unit. The weighted average units are equal to the number of units outstanding at the end of the period, adjusted proportionately for units added and redeemed based on the amount of time the units were outstanding during such period. There were no units held by USCF at June 30, 2012. Offering costs incurred in connection with the registration of additional units after the initial registration of units are borne by USOF. These costs include registration fees paid to regulatory agencies and all legal, accounting, printing and other expenses associated with such offerings. These costs are accounted for as a deferred charge and thereafter amortized to expense over twelve months on a straight-line basis or a shorter period if warranted. Cash equivalents include money market funds and overnight deposits or time deposits with original maturity dates of six months or less. Certain amounts in the accompanying condensed financial statements were reclassified to conform to the current presentation. The preparation of condensed financial statements in conformity with GAAP requires USCF to make estimates and assumptions that affect the reported amount of assets and liabilities and disclosure of contingent assets and liabilities at the date of the condensed financial statements, and the reported amounts of the revenue and expenses during the reporting period. Actual results may differ from those estimates and assumptions. Under the LP Agreement, USCF is responsible for investing the assets of USOF in accordance with the objectives and policies of USOF. In addition, USCF has arranged for one or more third parties to provide administrative, custody, accounting, transfer agency and other necessary services to USOF. For these services, USOF is contractually obligated to pay USCF a fee, which is paid monthly, equal to 0.45% per annum of average daily total net assets. USOF pays all costs and expenses associated with the ongoing registration of its units subsequent to the initial offering. These costs include registration or other fees paid to regulatory agencies in connection with the offer and sale of units, and all legal, accounting, printing and other expenses associated with such offer and sale. For the six months ended June 30, 2012 and 2011, USOF incurred $23,660 and $23,530, respectively, in registration fees and other offering expenses. USOF is responsible for paying its portion of the directors and officers liability insurance for USOF and the Related Public Funds and the fees and expenses of the independent directors who also serve as audit committee members of USOF and the Related Public Funds organized as limited partnerships and, as of July 8, 2011, the Related Public Funds organized as a series of a Delaware statutory trust. USOF shares the fees and expenses with each Related Public Fund, as described above, based on the relative assets of each fund computed on a daily basis. These fees and expenses for the year ending December 31, 2012 are estimated to be a total of $540,000 for USOF and the Related Public Funds. As discussed in Note 4 below, USOF entered into a licensing agreement with the NYMEX on April 10, 2006, as amended on October 20, 2011. Pursuant to the agreement, through October 19, 2011, USOF and the Related Public Funds, other than USBO, USCI, CPER, USAG and USMI, paid a licensing fee that was equal to 0.04% for the first $1,000,000,000 of combined net assets of the funds and 0.02% for combined net assets above $1,000,000,000. On and after October 20, 2011, USOF and the Related Public Funds, other than USBO, USCI, CPER, USAG and USMI, pay a licensing fee that is equal to 0.015% on all net assets. During the six months ended June 30, 2012 and 2011, USOF incurred $96,363 and $213,932, respectively, under this arrangement. The fees and expenses associated with USOFs audit expenses and tax accounting and reporting requirements are paid by USOF. These costs are estimated to be $1,200,000 for the year ending December 31, 2012. In addition to the fees described above, USOF pays all brokerage fees and other expenses in connection with the operation of USOF, excluding costs and expenses paid by USCF as outlined in Note 4 below. USOF is party to a marketing agent agreement, dated as of March 13, 2006, as amended from time to time, with the Marketing Agent and USCF, whereby the Marketing Agent provides certain marketing services for USOF as outlined in the agreement. The fees of the Marketing Agent, which are borne by USCF, include a marketing fee of $425,000 per annum plus the following incentive fee: 0.00% on USOFs assets from $0  $500 million; 0.04% on USOFs assets from $500 million  $4 billion; and 0.03% on USOFs assets in excess of $4 billion. The above fees do not include the following expenses, which are also borne by USCF: the cost of placing advertisements in various periodicals; web construction and development; or the printing and production of various marketing materials. USOF is also party to a custodian agreement, dated March 13, 2006, as amended from time to time, with Brown Brothers Harriman & Co. (BBH&Co.) and USCF, whereby BBH&Co. holds investments on behalf of USOF. USCF pays the fees of the custodian, which are determined by the parties from time to time. In addition, USOF is party to an administrative agency agreement, dated March 13, 2006, as amended from time to time, with USCF and BBH&Co., whereby BBH&Co. acts as the administrative agent, transfer agent and registrar for USOF. USCF also pays the fees of BBH&Co. for its services under such agreement and such fees are determined by the parties from time to time. Currently, USCF pays BBH&Co. for its services, in the foregoing capacities, a minimum amount of $75,000 annually for its custody, fund accounting and fund administration services rendered to USOF and each of the Related Public Funds, as well as a $20,000 annual fee for its transfer agency services. In addition, USCF pays BBH&Co. an asset-based charge of (a) 0.06% for the first $500 million of USOFs, USNGs, US12OFs, UGAs, USDHOs, USSOs, US12NGs, USBOs, USCIs, CPERs, USAGs and USMIs combined net assets, (b) 0.0465% for USOFs, USNGs, US12OFs, UGAs, USDHOs, USSOs, US12NGs, USBOs, USCIs, CPERs, USAGs and USMIs combined net assets greater than $500 million but less than $1 billion, and (c) 0.035% once USOFs, USNGs, US12OFs, UGAs, USDHOs, USSOs, US12NGs, USBOs, USCIs, CPERs, USAGs and USMIs combined net assets exceed $1 billion. The annual minimum amount will not apply if the asset-based charge for all accounts in the aggregate exceeds $75,000. USCF also pays transaction fees ranging from $7 to $15 per transaction. USOF has entered into a brokerage agreement with UBS Securities LLC (UBS Securities). The agreement requires UBS Securities to provide services to USOF in connection with the purchase and sale of Oil Futures Contracts and Other Oil-Related Investments that may be purchased and sold by or through UBS Securities for USOFs account. In accordance with the agreement, UBS Securities charges USOF commissions of approximately $7 to $15 per round-turn trade, including applicable exchange and NFA fees for Oil Futures Contracts and options on Oil Futures Contracts. Such fees include those incurred when purchasing Oil Futures Contracts and options on Oil Futures Contracts when USOF issues units as a result of a Creation Basket, as well as fees incurred when selling Oil Futures Contracts and options on Oil Futures Contracts when USOF redeems units as a result of a Redemption Basket. Such fees are also incurred when Oil Futures Contracts and options on Oil Futures Contracts are purchased or redeemed for the purpose of rebalancing the portfolio. USOF and the NYMEX entered into a licensing agreement on April 10, 2006, as amended on October 20, 2011, whereby USOF was granted a non-exclusive license to use certain of the NYMEXs settlement prices and service marks. Under the licensing agreement, USOF and the Related Public Funds, other than USBO, USCI, CPER, USAG and USMI, pay the NYMEX an asset-based fee for the license, the terms of which are described in Note 3. USOF expressly disclaims any association with the NYMEX or endorsement of USOF by the NYMEX and acknowledges that NYMEX and New York Mercantile Exchange are registered trademarks of the NYMEX. USOF engages in the trading of futures contracts, options on futures contracts and cleared swaps (collectively, derivatives). USOF is exposed to both market risk, which is the risk arising from changes in the market value of the contracts, and credit risk, which is the risk of failure by another party to perform according to the terms of a contract. USOF may enter into futures contracts, options on futures contracts and cleared swaps to gain exposure to changes in the value of an underlying commodity. A futures contract obligates the seller to deliver (and the purchaser to accept) the future delivery of a specified quantity and type of a commodity at a specified time and place. Some futures contracts may call for physical delivery of the asset, while others are settled in cash. The contractual obligations of a buyer or seller may generally be satisfied by taking or making physical delivery of the underlying commodity or by making an offsetting sale or purchase of an identical futures contract on the same or linked exchange before the designated date of delivery. The purchase and sale of futures contracts, options on futures contracts and cleared swaps require margin deposits with a futures commission merchant. Additional deposits may be necessary for any loss on contract value. The Commodity Exchange Act requires a futures commission merchant to segregate all customer transactions and assets from the futures commission merchants proprietary activities. Futures contracts and cleared swaps involve, to varying degrees, elements of market risk (specifically commodity price risk) and exposure to loss in excess of the amount of variation margin. The face or contract amounts reflect the extent of the total exposure USOF has in the particular classes of instruments. Additional risks associated with the use of futures contracts are an imperfect correlation between movements in the price of the futures contracts and the market value of the underlying securities and the possibility of an illiquid market for a futures contract. All of the futures contracts held by USOF were exchange-traded through June 30, 2012. The risks associated with exchange-traded contracts are generally perceived to be less than those associated with over-the-counter transactions since, in over-the-counter transactions, a party must rely solely on the credit of its respective individual counterparties. However, in the future, if USOF were to enter into non-exchange traded contracts, it would be subject to the credit risk associated with counterparty non-performance. The credit risk from counterparty non-performance associated with such instruments is the net unrealized gain, if any, on the transaction. USOF has credit risk under its futures contracts since the sole counterparty to all domestic and foreign futures contracts is the clearinghouse for the exchange on which the relevant contracts are traded. In addition, USOF bears the risk of financial failure by the clearing broker. USOFs cash and other property, such as short-term obligations of the United States of two years or less (Treasuries), deposited with a futures commission merchant are considered commingled with all other customer funds, subject to the futures commission merchants segregation requirements. In the event of a futures commission merchants insolvency, recovery may be limited to a pro rata share of segregated funds available. It is possible that the recovered amount could be less than the total of cash and other property deposited. The insolvency of a futures commission merchant could result in the complete loss of USOFs assets posted with that futures commission merchant; however, the majority of USOFs assets are held in Treasuries, cash and/or cash equivalents with USOFs custodian and would not be impacted by the insolvency of a futures commission merchant. The failure or insolvency of USOFs custodian, however, could result in a substantial loss of USOFs assets. USCF invests a portion of USOFs cash in money market funds that seek to maintain a stable per unit NAV. USOF is exposed to any risk of loss associated with an investment in such money market funds. As of June 30, 2012 and December 31, 2011, USOF held investments in money market funds in the amounts of $895,799,547 and $595,703,156, respectively. USOF also holds cash deposits with its custodian. Pursuant to a written agreement with BBH&Co., uninvested overnight cash balances are swept to offshore branches of U.S. regulated and domiciled banks located in Toronto, Canada, London, United Kingdom, Grand Cayman, Cayman Islands and Nassau, Bahamas, which are subject to U.S. regulation and regulatory oversight. As of June 30, 2012 and December 31, 2011, USOF held cash deposits and investments in Treasuries in the amounts of $428,238,330 and $546,571,564, respectively, with the custodian and futures commission merchant. Some or all of these amounts may be subject to loss should USOFs custodian and/or futures commission merchant cease operations. For derivatives, risks arise from changes in the market value of the contracts. Theoretically, USOF is exposed to market risk equal to the value of futures contracts purchased and unlimited liability on such contracts sold short. As both a buyer and a seller of options, USOF pays or receives a premium at the outset and then bears the risk of unfavorable changes in the price of the contract underlying the option. USOFs policy is to continuously monitor its exposure to market and counterparty risk through the use of a variety of financial, position and credit exposure reporting controls and procedures. In addition, USOF has a policy of requiring review of the credit standing of each broker or counterparty with which it conducts business. The financial instruments held by USOF are reported in its condensed statements of financial condition at market or fair value, or at carrying amounts that approximate fair value, because of their highly liquid nature and short-term maturity. The following table presents per unit performance data and other supplemental financial data for the six months ended June 30, 2012 and 2011 for the unitholders. This information has been derived from information presented in the condensed financial statements. Total returns are calculated based on the change in value during the period. An individual unitholders total return and ratio may vary from the above total returns and ratios based on the timing of contributions to and withdrawals from USOF. Level I  Quoted prices (unadjusted) in active markets for identical assets or liabilities that the reporting entity has the ability to access at the measurement date. Level II  Inputs other than quoted prices included within Level I that are observable for the asset or liability, either directly or indirectly. Level II assets include the following: quoted prices for similar assets or liabilities in active markets, quoted prices for identical or similar assets or liabilities in markets that are not active, inputs other than quoted prices that are observable for the asset or liability, and inputs that are derived principally from or corroborated by observable market data by correlation or other means (market-corroborated inputs). Level III  Unobservable pricing input at the measurement date for the asset or liability. Unobservable inputs shall be used to measure fair value to the extent that observable inputs are not available. In some instances, the inputs used to measure fair value might fall within different levels of the fair value hierarchy. The level in the fair value hierarchy within which the fair value measurement in its entirety falls shall be determined based on the lowest input level that is significant to the fair value measurement in its entirety. During the six months ended June 30, 2012, there were no transfers between Level I and Level II. During the year ended December 31, 2011, there were no transfers between Level I and Level II. Effective January 1, 2009, USOF adopted the provisions of Accounting Standards Codification 815  Derivatives and Hedging, which require presentation of qualitative disclosures about objectives and strategies for using derivatives, quantitative disclosures about fair value amounts and gains and losses on derivatives. In December 2011, the Financial Accounting Standards Board (FASB) issued Accounting Standards Update (ASU) No. 2011-11, Balance Sheet (Topic 210): Disclosures about Offsetting Assets and Liabilities. The amendments in ASU No. 2011-11 require an entity to disclose information about offsetting and related arrangements to enable users of its financial statements to understand the effect of those arrangements on its financial position. ASU No. 2011-11 is effective for annual reporting periods beginning on or after January 1, 2013, and interim periods within those annual periods. The guidance requires retrospective application for all comparative periods presented. USCF is currently evaluating the impact ASU No. 2011-11 will have on USOFs financial statements. USOF has performed an evaluation of subsequent events through the date the financial statements were issued. This evaluation did not result in any subsequent events that necessitated disclosures and/or adjustments. The following discussion should be read in conjunction with the condensed financial statements and the notes thereto of the United States Oil Fund, LP (USOF) included elsewhere in this quarterly report on Form 10-Q. This quarterly report on Form 10-Q, including this Managements Discussion and Analysis of Financial Condition and Results of Operations, contains forward-looking statements regarding the plans and objectives of management for future operations. This information may involve known and unknown risks, uncertainties and other factors that may cause USOFs actual results, performance or achievements to be materially different from future results, performance or achievements expressed or implied by any forward-looking statements. Forward-looking statements, which involve assumptions and describe USOFs future plans, strategies and expectations, are generally identifiable by use of the words may, will, should, expect, anticipate, estimate, believe, intend or project, the negative of these words, other variations on these words or comparable terminology. These forward-looking statements are based on assumptions that may be incorrect, and USOF cannot assure investors that the projections included in these forward-looking statements will come to pass. USOFs actual results could differ materially from those expressed or implied by the forward-looking statements as a result of various factors. USOF has based the forward-looking statements included in this quarterly report on Form 10-Q on information available to it on the date of this quarterly report on Form 10-Q, and USOF assumes no obligation to update any such forward-looking statements. Although USOF undertakes no obligation to revise or update any forward-looking statements, whether as a result of new information, future events or otherwise, investors are advised to consult any additional disclosures that USOF may make directly to them or through reports that USOF in the future files with the U.S. Securities and Exchange Commission (the SEC), including annual reports on Form 10-K, quarterly reports on Form 10-Q and current reports on Form 8-K.
USOF, a Delaware limited partnership, is a commodity pool that issues units that may be purchased and sold on the NYSE Arca, Inc. (the NYSE Arca). The investment objective of USOF is for the daily changes in percentage terms of its units per unit net asset value (NAV) to reflect the daily changes in percentage terms of the spot price of light, sweet crude oil delivered to Cushing, Oklahoma, as measured by the daily changes in the price of the futures contract for light, sweet crude oil traded on the New York Mercantile Exchange (the NYMEX) that is the near month contract to expire, except when the near month contract is within two weeks of expiration, in which case it will be measured by the futures contract that is the next month contract to expire (the Benchmark Oil Futures Contract), less USOFs expenses. Near month contract means the next contract traded on the NYMEX due to expire. Next month contract means the first contract traded on the NYMEX due to expire after the near month contract. It is not the intent of USOF to be operated in a fashion such that the per unit NAV will equal, in dollar terms, the spot price of light, sweet crude oil or any particular futures contract based on light, sweet crude oil. It is not the intent of USOF to be operated in a fashion such that its per unit NAV will reflect the percentage change of the price of any particular futures contract as measured over a time period greater than one day. The general partner of USOF, United States Commodity Funds LLC (USCF), believes that it is not practical to manage the portfolio to achieve such an investment goal when investing in Oil Futures Contracts (as defined below) and Other Oil-Related Investments (as defined below). USOF invests in futures contracts for light, sweet crude oil, other types of crude oil, heating oil, gasoline, natural gas and other petroleum-based fuels that are traded on the NYMEX, ICE Futures or other U.S. and foreign exchanges (collectively, Oil Futures Contracts) and other oil interests such as cash-settled options on Oil Futures Contracts, forward contracts for oil, cleared swap contracts and over-the-counter transactions that are based on the price of crude oil, other petroleum-based fuels, Oil Futures Contracts and indices based on the foregoing (collectively, Other Oil-Related Investments). For convenience and unless otherwise specified, Oil Futures Contracts and Other Oil-Related Investments collectively are referred to as Oil Interests in this quarterly report on Form 10-Q. USOF seeks to achieve its investment objective by investing in a combination of Oil Futures Contracts and Other Oil-Related Investments such that daily changes in its per unit NAV, measured in percentage terms, will closely track the daily changes in the price of the Benchmark Oil Futures Contract, also measured in percentage terms. USCF believes the daily changes in the price of the Benchmark Oil Futures Contract have historically exhibited a close correlation with the daily changes in the spot price of light, sweet crude oil. It is not the intent of USOF to be operated in a fashion such that the per unit NAV will equal, in dollar terms, the spot price of light, sweet crude oil or any particular futures contract based on light, sweet crude oil. It is not the intent of USOF to be operated in a fashion such that its per unit NAV will reflect the percentage change of the price of any particular futures contract as measured over a time period greater than one day. USCF believes that it is not practical to manage the portfolio to achieve such an investment goal when investing in Oil Futures Contracts and Other Oil-Related Investments. Impact of Accountability Levels, Position Limits and Price Fluctuation Limits. Futures contracts include typical and significant characteristics. Most significantly, the Commodity Futures Trading Commission (the CFTC) and U.S. designated contract markets such as the NYMEX have established accountability levels and position limits on the maximum net long or net short futures contracts in commodity interests that any person or group of persons under common trading control (other than as a hedge, which an investment in USOF is not) may hold, own or control. The net position is the difference between an individuals or firms open long contracts and open short contracts in any one commodity. In addition, most U.S.-based futures exchanges, such as the NYMEX, limit the daily price fluctuation for futures contracts. Currently, the ICE Futures imposes position and accountability limits that are similar to those imposed by U.S.-based futures exchanges but does not limit the maximum daily price fluctuation, while some other non-U.S. futures exchanges have not adopted such limits. The accountability levels for the Benchmark Oil Futures Contract and other Oil Futures Contracts traded on U.S.-based futures exchanges, such as the NYMEX, are not a fixed ceiling, but rather a threshold above which the NYMEX may exercise greater scrutiny and control over an investors positions. The current accountability level for investments for any one month in the Benchmark Oil Futures Contract is 10,000 contracts. In addition, the NYMEX imposes an accountability level for all months of 20,000 net futures contracts for light, sweet crude oil. If USOF and the Related Public Funds (as defined below) exceed these accountability levels for investments in the futures contracts for light, sweet crude oil, the NYMEX will monitor such exposure and ask for further information on their activities including the total size of all positions, investment and trading strategy, and the extent of liquidity resources of USOF and the Related Public Funds. If deemed necessary by the NYMEX, it could also order USOF to reduce its aggregate position back to the accountability level. In addition, the ICE Futures maintains the same accountability levels, position limits and monitoring authority for its light, sweet crude oil contract as the NYMEX. As of June 30, 2012, USOF held 13,918 futures contracts for light, sweet crude oil traded on the NYMEX and 2,000 Oil Futures Contracts traded on the ICE Futures. USOF exceeded accountability levels imposed by the NYMEX during the six months ended June 30, 2012. The maximum number of contracts held during the period was 13,918 CL Futures Contracts on June 30, 2012, exceeding the any month limit. No action was taken by the NYMEX. USOF did not exceed accountability levels imposed by the ICE Futures for the six months ended June 30, 2012. Position limits differ from accountability levels in that they represent fixed limits on the maximum number of future contracts that any person may hold and cannot allow such limits to be exceeded without express CFTC authority to do so. In addition to accountability levels and position limits that may apply at any time, the NYMEX and the ICE Futures impose position limits on contracts held in the last few days of trading in the near month contract to expire. It is unlikely that USOF will run up against such position limits because USOFs investment strategy is to close out its positions and roll from the near month contract to expire to the next month contract during a four-day period beginning two weeks from expiration of the contract. For the six months ended June 30, 2012, USOF did not exceed any position limits imposed by the NYMEX and ICE Futures. On October 18, 2011, the CFTC adopted new rules, which establish position limits and limit formulas for certain physical commodity futures including Oil Futures Contracts and options on Oil Futures Contracts, executed pursuant to the rules of designated contract markets (i.e., certain regulated exchanges) and commodity swaps that are economically equivalent to such futures and options contracts. See Introduction  Futures Contracts and Position Limits in this quarterly report on Form 10-Q for information regarding the Dodd-Frank Wall Street Reform and Consumer Protection Act (the Dodd-Frank Act). The regulation of commodity interests in the United States is subject to ongoing modification by governmental and judicial action. On July 21, 2010, a broad financial regulatory reform bill, the Dodd-Frank Act, was signed into law. All of the Dodd-Frank Acts provisions became effective on July 16, 2011, but the actual implementation of some of the provisions is subject to continuing uncertainty because implementing rules and regulations have not been completely finalized and have been challenged in court. Pending final resolution of all applicable regulatory requirements, some specific examples of how the new Dodd-Frank Act provisions and rules adopted thereunder could impact USOF are discussed below. Provisions in the Dodd-Frank Act include the requirement that position limits be established on a wide range of commodity interests including energy-based and other commodity futures contracts, certain cleared commodity swaps and certain over-the-counter commodity contracts; new registration, recordkeeping, capital and margin requirements for swap dealers and major swap participants as determined by the new law and applicable regulations; and the forced use of clearinghouse mechanisms for many swap transactions that are currently entered into in the over-the-counter market. The new law and the rules thereunder may negatively impact USOFs ability to meet its investment objective either through limits or requirements imposed on it or upon its counterparties. Further, increased regulation of, and the imposition of additional costs on, swap transactions under the new legislation and implementing regulations could cause a reduction in the swap market and the overall derivatives markets, which could restrict liquidity and adversely affect USOF. In particular, new position limits imposed on USOF or its counterparties may impact USOFs ability to invest in a manner that most efficiently meets its investment objective, and new requirements, including capital and mandatory clearing, may increase the cost of USOFs investments and doing business, which could adversely impact the ability of USOF to achieve its investment objective. On October 18, 2011, the CFTC adopted regulations implementing position limits and limit formulas for 28 core physical commodity futures contracts, including the Oil Futures Contracts and options on Oil Futures Contracts executed pursuant to the rules of designated contract markets (i.e., certain regulated exchanges) and commodity swaps that are economically equivalent to such futures and options contracts (collectively, Referenced Contracts). The new regulations require, among other things, aggregation of position limits that would apply across different trading venues to contracts based on the same underlying commodity. However, the regulations would require aggregation of Referenced Contracts held by separate Related Public Funds (as defined below) only if such Related Public Funds had identical trading strategies. USCF does not believe any of the Related Public Funds should be viewed as having identical trading strategies for purposes of the CFTCs aggregation rules. Although the regulations became effective on January 17, 2012, the position limit rules will be implemented in two phases: spot-month position limits and non-spot-month position limits. Spot-month limits will be effective sixty days after the term swap is defined under the Dodd-Frank Act (see below). The limits adopted will be based on the spot-month position limit levels currently in place at applicable futures exchanges (or designated contract market or DCM). Thereafter, the spot-month limits will be adjusted annually for energy contracts. These subsequent limits will be based on the CFTCs determination of deliverable supply in consultation with the futures exchanges. Spot-month position limit levels will be set generally at 25% of estimated deliverable supply, and limits will be applied separately for physical-delivery and cash-settled contracts in the same commodity. Non-spot-month position limits will go into effect by CFTC order after the CFTC has received one year of open interest data on physical commodity cleared and uncleared swaps under the swaps large trader reporting rule. The non-spot month limits will be adjusted biennially based on Referenced Contract open interest. Non-spot-month position limits (i.e., limits applied to positions in all contract months combined or in a single contract month) will be set using the 10/2.5 percent formula: 10 percent of the contracts first 25,000 of open interest and 2.5 percent thereafter. These limits will be reset biennially based on two years of open interest data. On December 2, 2011, the Securities Industry and Financial Markets Association (SIFMA) and the International Swaps and Derivatives Association (ISDA) filed a lawsuit challenging the CFTCs position limits rule. The lawsuit asserts that the position limits rule inadequately fulfills the required cost-benefit analysis. It is not known at this time what effect this lawsuit will have on the implementation of the new position limits rule. Based on its current understanding of the final position limit regulations, USCF does not anticipate significant negative impact on the ability of USOF to achieve its investment objective. However, as of the filing of this quarterly report on Form 10-Q, additional studies are required to be conducted before all requirements of the final rules are implemented, and therefore, it cannot be determined with certainty what impact such regulations will have on USOF. The Dodd-Frank Act imposes new regulatory requirements on certain swap transactions that USOF is authorized to engage in that may ultimately impact the ability of USOF to meet its investment objective. On May 23, 2011, the CFTC and the SEC published joint proposed rules defining the term swap and thus providing more clarity regarding which transactions will be regulated as such under the Dodd-Frank Act. On July 13, 2012, the CFTC published a pre-publication version of the joint CFTC and SEC final rules that provide further definition of the terms swap and security-based swaps. The term swap is broadly defined to include various types of over-the-counter derivatives, including swaps and options. The effective date of these final rules will be 60 days after the publication of such final rules in the Federal Register, which has not occurred as of the date of filing of this quarterly report on Form 10-Q. The Dodd-Frank Act requires that certain transactions ultimately falling within the definition of swap be executed on organized exchanges or swap execution facilities and cleared through regulated clearing organizations (which are referred to in the Dodd-Frank Act as derivative clearing organizations (DCOs)). However, as described above, it is currently unknown which swaps will be subject to such trading and clearing requirements. If a swap is required to be cleared, the initial margin will be set by the clearing organization, subject to certain regulatory requirements and guidelines. Initial and variation margin requirements for swap dealers and major swap participants who enter into uncleared swaps and capital requirements for swap dealers and major swap participants who enter into both cleared and uncleared trades will be set by the CFTC, the SEC or the applicable Prudential Regulator. On May 23, 2012, the CFTC published final regulations, which are not yet effective, to determine which entities will be regulated as swap dealers and major swap participants and thus have to comply with these capital and margin requirements (as well as a multitude of other requirements under the Dodd-Frank Act). In general, increased regulation of, and the imposition of additional costs on, swap transactions could have an adverse effect on USOF by, for example, reducing the size of and therefore liquidity in the derivatives market, increasing transaction costs and decreasing the ability to customize derivative transactions. The final rule regarding review of swaps for mandatory clearing went effective September 26, 2011. On July 14, 2011, the CFTC issued an order providing temporary relief from certain swaps-related provisions of Title VII that would have automatically taken effect on July 16, 2011. The final order granted temporary exemptive relief that, by its terms, expires upon the earlier of the effective date of the required final rulemaking or December 31, 2011. On October 18, 2011, the CFTC issued an order, which modified the July 14, 2011 order by extending the temporary exemptive relief to the earlier of the effective date of the required final rulemaking or July 16, 2012. On July 13, 2012, the CFTC issued an order to, in pertinent part, extend the temporary exemptive relief to December 31, 2012. On February 7, 2012, the CFTC published a rule requiring each futures commission merchant (FCM) and DCO to segregate cleared swaps and related collateral posted by a customer of the FCM from the assets of the FCM or DCO, although such property can be commingled with the property of other cleared swaps customers of the FCM or DCO. This rule addresses losses incurred by a DCO in a so-called double default scenario in which a customer of an FCM defaults in its obligations to the FCM and the FCM, in turn, defaults in its obligations to the DCO. Under this scenario, the DCO can only access the collateral attributable to other customers of the DCO whose cleared swap positions are in a loss position following the primary customers default. This rule is scheduled to become effective on November 8, 2012. Some market participants have expressed concern that the requirements of this segregation rule may result in higher initial margins or higher fees. USOF does not anticipate any impact to its operations in order to meet the requirements of the new rule. Additionally, the CFTC published rules on February 17, 2012 and April 3, 2012 that require swap dealers and major swap participants to: 1) adhere to business conduct standards, 2) implement policies and procedures to ensure compliance with the Commodity Exchange Act and 3) maintain records of such compliance. These new requirements may impact the documentation requirements for both cleared and non-cleared swaps and cause swap dealers and major swap participants to face increased compliance costs that, in turn, may be passed along to counterparties (such as USOF) in the form of higher fees and expenses that related to trading swaps. On February 24, 2012, the CFTC amended certain disclosure obligations to require that the operator of a commodity pool that invests in swaps include standardized swap risk disclosures in the pools disclosure documents by December 31, 2012. The CFTC issued a final rule on May 23, 2012 interpreting the definition of eligible contract participant, as amended by the Dodd-Frank Act, in such a manner that USOF may be limited as to the counterparties with which it may enter into currency forward contracts. Additionally, USOF may under certain circumstances related to the amount of assets under management no longer qualify as an eligible contract participant. USOFs ability to maintain a certain minimum level of assets to qualify as an eligible contract participant allows USOF to enter into swaps on swap execution facilities as well as on a bilateral, off-exchange basis. The loss of status as an eligible contract participant and the resulting loss of eligible counterparties and investment options could impact USOFs ability to achieve its investment objective. The effect of the future regulatory change on USOF is impossible to predict, but it could be substantial and adverse. USCF, which is registered as a commodity pool operator (CPO) with the CFTC, is authorized by the Fifth Amended and Restated Agreement of Limited Partnership of USOF (the LP Agreement) to manage USOF. USCF is authorized by USOF in its sole judgment to employ and establish the terms of employment for, and termination of, commodity trading advisors or FCMs. During the six months ended June 30, 2012, the level of contango remained mild, meaning that the price of the near month crude Oil Futures Contract was less than the price of the next month crude Oil Futures Contract, or contracts further away from expiration. Crude oil inventories, which reached historic levels in January 2009 and February 2009 and which appeared to be the primary cause of the steep level of contango, began to drop in March 2009 and continued to drop for the remainder of 2009 and the beginning of 2010. During the year ended December 31, 2011, crude oil inventories began to climb higher, which contributed to the crude oil futures market remaining in contango through the end of December 2011. During the six months ended June 30, 2012, crude oil inventories continued to climb higher, which contributed to the crude oil futures market remaining in contango through the end of June 2012. For a discussion of the impact of backwardation and contango on total returns, see Term Structure of Crude Oil Prices and the Impact on Total Returns below. The per unit NAV of USOFs units is calculated once each NYSE Arca trading day. The per unit NAV for a particular trading day is released after 4:00 p.m. New York time. Trading during the core trading session on the NYSE Arca typically closes at 4:00 p.m. New York time. USOFs administrator uses the NYMEX closing price (determined at the earlier of the close of the NYMEX or 2:30 p.m. New York time) for the contracts held on the NYMEX, but calculates or determines the value of all other USOF investments, including ICE Futures contracts or other futures contracts, as of the earlier of the close of the NYSE Arca or 4:00 p.m. New York time. Results of Operations. On April 10, 2006, USOF listed its units on the American Stock Exchange (the AMEX) under the ticker symbol USO. On that day, USOF established its initial offering price at $67.39 per unit and issued 200,000 units to the initial authorized purchaser, KV Execution Services LLC, in exchange for $13,479,000 in cash. As a result of the acquisition of the AMEX by NYSE Euronext, USOFs units no longer trade on the AMEX and commenced trading on the NYSE Arca on November 25, 2008. Since its initial offering of 17,000,000 units, USOF has registered seven subsequent offerings of its units: 30,000,000 units which were registered with the SEC on October 18, 2006, 50,000,000 units which were registered with the SEC on January 30, 2007, 30,000,000 units which were registered with the SEC on December 4, 2007, 100,000,000 units which were registered with the SEC on February 7, 2008, 100,000,000 units which were registered with the SEC on September 29, 2008, 300,000,000 units which were registered with the SEC on January 16, 2009 and 1,000,000,000 units which were registered with the SEC on June 29, 2009. Units offered by USOF in the subsequent offerings were sold by it for cash at the units per unit NAV as described in the applicable prospectus. As of June 30, 2012, USOF had issued 751,100,000 units, 42,400,000 of which were outstanding. As of June 30, 2012, there were 875,900,000 units registered but not yet issued. More units may have been issued by USOF than are outstanding due to the redemption of units. Unlike funds that are registered under the Investment Company Act of 1940, as amended, units that have been redeemed by USOF cannot be resold by USOF. As a result, USOF contemplates that additional offerings of its units will be registered with the SEC in the future in anticipation of additional issuances and redemptions. As of June 30, 2012, USOF had the following authorized purchasers: ABN Amro, Banc of America Securities LLC, Citigroup Global Markets Inc., Credit Suisse USA, Deutsche Bank Securities Inc., Fimat USA LLC, Goldman Sachs & Company, Goldman Sachs Execution & Clearing LP, JP Morgan Securities Inc., Knight Clearing Services LLC, Merrill Lynch Professional Clearing Corp., Morgan Stanley & Company Inc., Nomura Securities International Inc., Pru Global Securities, LLC, RBC Capital Markets Corporation, SG Americas Securities LLC, Timber Hill LLC, Virtu Financial Capital Markets, Virtu Financial DB LLC and Wedbush Securities Inc.
As of June 30, 2012, the total unrealized gain on Oil Futures Contracts owned or held on that day was $15,920,040 and USOF established cash deposits and investments in short term obligations of the United States of two years or less (Treasuries) and money market funds that were equal to $1,324,037,877. USOF held 77.70% of its cash assets in overnight deposits and money market funds at its custodian bank, while 22.30% of the cash balance was held as Treasuries and margin deposits for the Oil Futures Contracts purchased. The ending per unit NAV on June 30, 2012 was $31.89. By comparison, as of June 30, 2011, the total unrealized loss on Oil Futures Contracts owned or held on that day was $59,309,100 and USOF established cash deposits and investments in money market funds that were equal to $1,579,528,256. USOF held 79.30% of its cash assets in overnight deposits and money market funds at its custodian bank, while 20.70% of the cash balance was held as margin deposits for the Oil Futures Contracts purchased. The decrease in cash assets in overnight deposits, Treasuries and money market funds for June 30, 2012, as compared to June 30, 2011, was the result of USOFs greater size as of June 30, 2011 as measured by total net assets. The ending per unit NAV on June 30, 2011 was $37.43. The decrease in the per unit NAV for June 30, 2012, as compared to June 30, 2011, was primarily a result of a decrease in the price of crude oil futures contracts between the period ended June 30, 2011 and the period ended June 30, 2012. Portfolio Expenses. USOFs expenses consist of investment management fees, brokerage fees and commissions, certain offering costs, licensing fees, the fees and expenses of the independent directors of USCF and expenses relating to tax accounting and reporting requirements. The management fee that USOF pays to USCF is calculated as a percentage of the total net assets of USOF. USOF pays USCF a management fee of 0.45% of its average daily total net assets. The fee is accrued daily and paid monthly. During the six months ended June 30, 2012, the average daily total net assets of USOF were $1,291,901,627. The management fee incurred by USOF during the period amounted to $2,890,895. By comparison, during the six months ended June 30, 2011, the average daily total net assets of USOF were $1,755,961,700. The management fee paid by USOF during the period amounted to $3,918,441. In addition to the management fee, USOF pays all brokerage fees and other expenses, including tax reporting costs, licensing fees for the use of intellectual property, ongoing registration or other fees paid to the SEC, the Financial Industry Regulatory Authority (FINRA) and any other regulatory agency in connection with offers and sales of its units subsequent to the initial offering and all legal, accounting, printing and other expenses associated therewith. The total of these fees and expenses for the six months ended June 30, 2012 was $1,525,205, as compared to $1,860,598 for the six months ended June 30, 2011. The decrease in total expenses excluding management fees for the six months ended June 30, 2012 as compared to the six months ended June 30, 2011, was primarily due to USOFs smaller size as measured by total net assets during the six months ended June 30, 2012. For the six months ended June 30, 2012, USOF incurred $23,660 in ongoing registration fees and other expenses relating to the registration and offering of additional units. By comparison, for the six months ended June 30, 2011, USOF incurred $23,530 in ongoing registration fees and other expenses relating to the registration and offering of additional units. The slight increase in registration fees and expenses incurred by USOF for the six months ended June 30, 2012, as compared to the six months ended June 30, 2011, was primarily due to one extra day in the reporting period for the six months ended June 30, 2012. USOF is responsible for paying its portion of the directors and officers liability insurance of USOF and the United States Natural Gas Fund, LP, the United States 12 Month Oil Fund, LP, the United States Gasoline Fund, LP, the United States Diesel-Heating Oil Fund, LP (formerly, the United States Heating Oil Fund, LP), the United States Short Oil Fund, LP, the United States 12 Month Natural Gas Fund, LP, the United States Brent Oil Fund, LP, the United States Commodity Index Fund, the United States Copper Index Fund, the United States Agriculture Index Fund and the United States Metals Index Fund (collectively, the Related Public Funds) and the fees and expenses of the independent directors who also serve as audit committee members of USOF and the Related Public Funds organized as limited partnerships and, as of July 8, 2011, the Related Public Funds organized as a series of a Delaware statutory trust. USOF shares the fees and expenses with each Related Public Fund, as described above, based on the relative assets of each fund computed on a daily basis. These fees and expenses for the year ending December 31, 2012 are estimated to be a total of $540,000 for USOF and the Related Public Funds. By comparison, for the year ended December 31, 2011, these fees and expenses amounted to a total of $607,582 for USOF and the Related Public Funds. USOFs portion of such fees and expenses was $229,954. USOF also incurs commissions to brokers for the purchase and sale of Oil Futures Contracts, Other Oil-Related Investments or Treasuries. During the six months ended June 30, 2012, total commissions accrued to brokers amounted to $630,956. Of this amount, $536,421 was a result of rebalancing costs and $94,535 was the result of trades necessitated by creation and redemption activity. By comparison, during the six months ended June 30, 2011, total commissions accrued to brokers amounted to $843,195. The decrease in the total commissions accrued to brokers for the six months ended June 30, 2012, as compared to the six months ended June 30, 2011, was primarily a result of the decrease in USOFs total net assets during the six months ended June 30, 2012, as compared to the six months ended June 30, 2011. As an annualized percentage of average daily total net assets, the figure for the six months ended June 30, 2012 represents approximately 0.10% of average daily total net assets. By comparison, the figure for the six months ended June 30, 2011 represented approximately 0.09% of average daily total net assets. However, there can be no assurance that commission costs and portfolio turnover will not cause commission expenses to rise in future quarters. Dividend and Interest Income. USOF seeks to invest its assets such that it holds Oil Futures Contracts and Other Oil-Related Investments in an amount equal to the total net assets of its portfolio. Typically, such investments do not require USOF to pay the full amount of the contract value at the time of purchase, but rather require USOF to post an amount as a margin deposit against the eventual settlement of the contract. As a result, USOF retains an amount that is approximately equal to its total net assets, which USOF invests in Treasuries, cash and/or cash equivalents. This includes both the amount on deposit with the FCM as margin, as well as unrestricted cash and cash equivalents held with USOFs custodian bank. The Treasuries, cash and/or cash equivalents earn income that accrues on a daily basis. For the six months ended June 30, 2012, USOF earned $179,856 in dividend and interest income on such cash and/or cash equivalents. Based on USOFs average daily total net assets, this was equivalent to an annualized yield of 0.03%. USOF purchased Treasuries during the six months ended June 30, 2012 and also held cash and/or cash equivalents during this time period. By comparison, for the six months ended June 30, 2011, USOF earned $169,144 in dividend and interest income on such cash and/or cash equivalents. Based on USOFs average daily total net assets, this was equivalent to an annualized yield of 0.02%. USOF did not purchase Treasuries during the six months ended June 30, 2011 and held only cash and/or cash equivalents during this time period. Interest rates on short-term investments held by USOF, including cash, cash equivalents and Treasuries, were higher during the six months ended June 30, 2012 compared to the six months ended June 30, 2011. As a result, the amount of income earned by USOF as a percentage of average daily total net assets was higher during the six months ended June 30, 2012 compared to the six months ended June 30, 2011. Portfolio Expenses. During the three months ended June 30, 2012, the average daily total net assets of USOF were $1,227,033,281. The management fee incurred by USOF during the period amounted to $1,372,870. By comparison, during the three months ended June 30, 2011, the average daily total net assets of USOF were $1,590,917,801. The management fee paid by USOF during the period amounted to $1,784,880. In addition to the management fee, USOF pays all brokerage fees and other expenses, including tax reporting costs, licensing fees for the use of intellectual property, ongoing registration or other fees paid to the SEC, FINRA and any other regulatory agency in connection with offers and sales of its units subsequent to the initial offering and all legal, accounting, printing and other expenses associated therewith. The total of these fees and expenses for the three months ended June 30, 2012 was $799,762, as compared to $854,481 for the three months ended June 30, 2011. The decrease in total expenses excluding management fees for the three months ended June 30, 2012 as compared to the three months ended June 30, 2011, was primarily due to USOFs smaller size as measured by total net assets during the three months ended June 30, 2012. For the three months ended June 30, 2012 and 2011, USOF incurred $11,830 in ongoing registration fees and other expenses relating to the registration and offering of additional units. The registration fees and expenses incurred by USOF remained the same for the three months ended June 30, 2012, as compared to the three months ended June 30, 2011. USOF is responsible for paying its portion of the directors and officers liability insurance of USOF and the Related Public Funds and the fees and expenses of the independent directors who also serve as audit committee members of USOF and the Related Public Funds organized as limited partnerships and, as of July 8, 2011, the Related Public Funds organized as a series of a Delaware statutory trust. USOF shares the fees and expenses with each Related Public Fund, as described above, based on the relative assets of each fund computed on a daily basis. These fees and expenses for the year ending December 31, 2012 are estimated to be a total of $540,000 for USOF and the Related Public Funds. By comparison, for the year ended December 31, 2011, these fees and expenses amounted to a total of $607,582 for USOF and the Related Public Funds. USOFs portion of such fees and expenses was $229,954. USOF also incurs commissions to brokers for the purchase and sale of Oil Futures Contracts, Other Oil-Related Investments or Treasuries. During the three months ended June 30, 2012, total commissions accrued to brokers amounted to $323,199. Of this amount, $269,621 was a result of rebalancing costs and $53,579 was the result of trades necessitated by creation and redemption activity. By comparison, during the three months ended June 30, 2011, total commissions accrued to brokers amounted to $361,481. The decrease in the total commissions accrued to brokers for the three months ended June 30, 2012, as compared to the three months ended June 30, 2011, was primarily a result of the decrease in USOFs total net assets and an increase in the price of crude oil futures contracts during the three months ended June 30, 2012, as compared to the three months ended June 30, 2011. As an annualized percentage of average daily total net assets, the figure for the three months ended June 30, 2012 represents approximately 0.10% of average daily total net assets. By comparison, the figure for the three months ended June 30, 2011 represented approximately 0.09% of average daily total net assets. However, there can be no assurance that commission costs and portfolio turnover will not cause commission expenses to rise in future quarters. Dividend and Interest Income. USOF seeks to invest its assets such that it holds Oil Futures Contracts and Other Oil-Related Investments in an amount equal to the total net assets of its portfolio. Typically, such investments do not require USOF to pay the full amount of the contract value at the time of purchase, but rather require USOF to post an amount as a margin deposit against the eventual settlement of the contract. As a result, USOF retains an amount that is approximately equal to its total net assets, which USOF invests in Treasuries, cash and/or cash equivalents. This includes both the amount on deposit with the FCM as margin, as well as unrestricted cash and cash equivalents held with USOFs custodian bank. The Treasuries, cash and/or cash equivalents earn income that accrues on a daily basis. For the three months ended June 30, 2012, USOF earned $100,527 in dividend and interest income on such cash and/or cash equivalents. Based on USOFs average daily total net assets, this was equivalent to an annualized yield of 0.03%. USOF purchased Treasuries during the three months ended June 30, 2012 and also held cash and/or cash equivalents during this time period. By comparison, for the three months ended June 30, 2011, USOF earned $43,357 in dividend and interest income on such cash and/or cash equivalents. Based on USOFs average daily total net assets, this was equivalent to an annualized yield of 0.01%. USOF did not purchase Treasuries during the three months ended June 30, 2011 and held only cash and/or cash equivalents during this time period. Interest rates on short-term investments held by USOF, including cash, cash equivalents and Treasuries, were higher during the three months ended June 30, 2012 compared to the three months ended June 30, 2011. As a result, the amount of income earned by USOF as a percentage of average daily total net assets was higher during the three months ended June 30, 2012 compared to the three months ended June 30, 2011. USCF seeks to manage USOFs portfolio such that changes in its average daily per unit NAV, on a percentage basis, closely track the daily changes in the average price of the Benchmark Oil Futures Contract, also on a percentage basis. Specifically, USCF seeks to manage the portfolio such that over any rolling period of 30-valuation days, the average daily change in USOFs per unit NAV is within a range of 90% to 110% (0.9 to 1.1) of the average daily change in the price of the Benchmark Oil Futures Contract. As an example, if the average daily movement of the price of the Benchmark Oil Futures Contract for a particular 30-valuation day time period was 0.50% per day, USCF would attempt to manage the portfolio such that the average daily movement of the per unit NAV during that same time period fell between 0.45% and 0.55% (i.e., between 0.9 and 1.1 of the benchmarks results). USOFs portfolio management goals do not include trying to make the nominal price of USOFs per unit NAV equal to the nominal price of the current Benchmark Oil Futures Contract or the spot price for light, sweet crude oil. USCF believes that it is not practical to manage the portfolio to achieve such an investment goal when investing in listed Oil Futures Contracts. For the 30-valuation days ended June 30, 2012, the simple average daily change in the Benchmark Oil Futures Contract was (0.282)%, while the simple average daily change in the per unit NAV of USOF over the same time period was (0.285)%. The average daily difference was (0.003)% (or (0.3) basis points, where 1 basis point equals 1/100 of 1%). As a percentage of the daily movement of the Benchmark Oil Futures Contract, the average error in daily tracking by the per unit NAV was (1.752)%, meaning that over this time period USOFs tracking error was within the plus or minus 10% range established as its benchmark tracking goal. A significant portion of the level of USOFs relative tracking error as a percentage of the benchmark was due to periods of flat price returns. 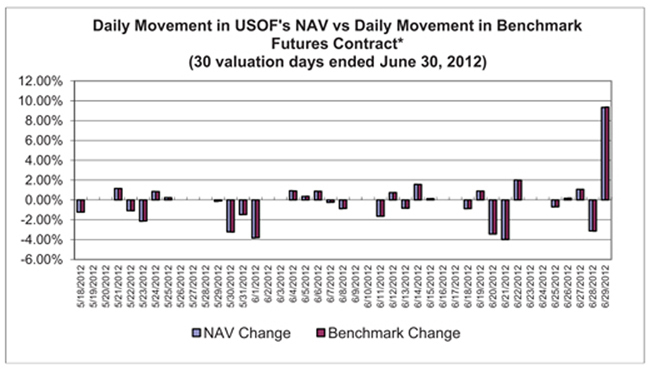 The first chart below shows the daily movement of USOFs per unit NAV versus the daily movement of the Benchmark Oil Futures Contract for the 30-valuation day period ended June 30, 2012. The second chart below shows the monthly total returns of USOF as compared to the monthly value of the Benchmark Oil Futures Contract since inception. Since the commencement of the offering of USOFs units to the public on April 10, 2006 to June 30, 2012, the simple average daily change in the Benchmark Oil Futures Contract was (0.021)%, while the simple average daily change in the per unit NAV of USOF over the same time period was (0.019)%. The average daily difference was (0.002)% (or (0.2) basis points, where 1 basis point equals 1/100 of 1%). As a percentage of the daily movement of the Benchmark Oil Futures Contract, the average error in daily tracking by the per unit NAV was 0.629%, meaning that over this time period USOFs tracking error was within the plus or minus 10% range established as its benchmark tracking goal. An alternative tracking measurement of the return performance of USOF versus the return of its Benchmark Oil Futures Contract can be calculated by comparing the actual return of USOF, measured by changes in its per unit NAV, versus the expected changes in its per unit NAV under the assumption that USOFs returns had been exactly the same as the daily changes in its Benchmark Oil Futures Contract. For the six months ended June 30, 2012, the actual total return of USOF as measured by changes in its per unit NAV was (16.23)%. This is based on an initial per unit NAV of $38.07 on December 31, 2011 and an ending per unit NAV as of June 30, 2012 of $31.89. During this time period, USOF made no distributions to its unitholders. However, if USOFs daily changes in its per unit NAV had instead exactly tracked the changes in the daily total return of the Benchmark Oil Futures Contract, USOF would have had an estimated per unit NAV of $31.99 as of June 30, 2012, for a total return over the relevant time period of (15.97)%. The difference between the actual per unit NAV total return of USOF of (16.23)% and the expected total return based on the Benchmark Oil Futures Contract of (15.97)% was an error over the time period of (0.26)%, which is to say that USOFs actual total return underperformed the benchmark result by that percentage. USCF believes that a portion of the difference between the actual total return and the expected benchmark total return can be attributed to the net impact of the expenses that USOF pays, offset in part by the income that USOF collects on its cash and cash equivalent holdings. During the six months ended June 30, 2012, USOF earned dividend and interest income of $179,856, which is equivalent to a weighted average income rate of 0.03% for such period. In addition, during the six months ended June 30, 2012, USOF also collected $91,000 from its Authorized Purchasers for creating or redeeming baskets of units. This income also contributed to USOFs actual total return. During the six months ended June 30, 2012, USOF incurred total expenses of $4,416,100. Income from dividends and interest and Authorized Purchaser collections net of expenses was $(4,145,244), which is equivalent to an annualized weighted average net income rate of (0.65)% for the six months ended June 30, 2012. By comparison, for the six months ended June 30, 2011, the actual total return of USOF as measured by changes in its per unit NAV was (3.95)%. This was based on an initial per unit NAV of $38.97 on December 31, 2010 and an ending per unit NAV as of June 30, 2011 of $37.43. During this time period, USOF made no distributions to its unitholders. 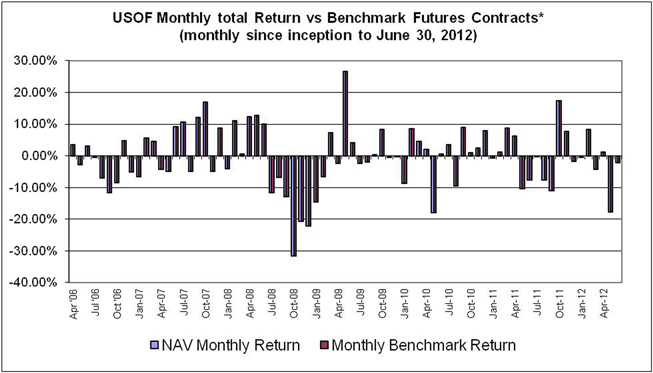 However, if USOFs daily changes in its per unit NAV had instead exactly tracked the changes in the daily total return of the Benchmark Oil Futures Contract, USOF would have had an estimated per unit NAV of $37.55 as of June 30, 2011, for a total return over the relevant time period of (3.64)%. The difference between the actual per unit NAV total return of USOF of (3.95)% and the expected total return based on the Benchmark Oil Futures Contract of (3.64)% was an error over the time period of (0.31)%, which is to say that USOFs actual total return underperformed the benchmark result by that percentage. USCF believes that a portion of the difference between the actual total return and the expected benchmark total return can be attributed to the net impact of the expenses that USOF paid, offset in part by the income that USOF collected on its cash and cash equivalent holdings. During the six months ended June 30, 2011, USOF earned dividend and interest income of $169,144, which was equivalent to a weighted average income rate of 0.02% for such period. In addition, during the six months ended June 30, 2011, USOF also collected $150,000 from its Authorized Purchasers for creating or redeeming baskets of units. This income also contributed to USOFs actual total return. During the six months ended June 30, 2011, USOF incurred total expenses of $5,779,039. Income from dividends and interest and Authorized Purchaser collections net of expenses was $(5,459,895), which was equivalent to an annualized weighted average net income rate of (0.63)% for the six months ended June 30, 2011. There are currently three factors that have impacted or are most likely to impact USOFs ability to accurately track its Benchmark Oil Futures Contract. First, USOF may buy or sell its holdings in the then current Benchmark Oil Futures Contract at a price other than the closing settlement price of that contract on the day during which USOF executes the trade. In that case, USOF may pay a price that is higher, or lower, than that of the Benchmark Oil Futures Contract, which could cause the changes in the daily per unit NAV of USOF to either be too high or too low relative to the daily changes in the Benchmark Oil Futures Contract. During the six months ended June 30, 2012, USCF attempted to minimize the effect of these transactions by seeking to execute its purchase or sale of the Benchmark Oil Futures Contract at, or as close as possible to, the end of the day settlement price. However, it may not always be possible for USOF to obtain the closing settlement price and there is no assurance that failure to obtain the closing settlement price in the future will not adversely impact USOFs attempt to track the Benchmark Oil Futures Contract over time. Second, USOF earns dividend and interest income on its cash, cash equivalents and Treasuries. USOF is not required to distribute any portion of its income to its unitholders and did not make any distributions to unitholders during the six months ended June 30, 2012. Interest payments, and any other income, were retained within the portfolio and added to USOFs NAV. When this income exceeds the level of USOFs expenses for its management fee, brokerage commissions and other expenses (including ongoing registration fees, licensing fees and the fees and expenses of the independent directors of USCF), USOF will realize a net yield that will tend to cause daily changes in the per unit NAV of USOF to track slightly higher than daily changes in the Benchmark Oil Futures Contract. During the six months ended June 30, 2012, USOF earned, on an annualized basis, approximately 0.03% on its cash and cash equivalent holdings. It also incurred cash expenses on an annualized basis of 0.45% for management fees, approximately 0.10% in brokerage commission costs related to the purchase and sale of futures contracts and approximately 0.14% for other expenses. The foregoing fees and expenses resulted in a net yield on an annualized basis of approximately (0.66)% and affected USOFs ability to track its benchmark. If short-term interest rates rise above the current levels, the level of deviation created by the yield would decrease. Conversely, if short-term interest rates were to decline, the amount of error created by the yield would increase. When short-term yields drop to a level lower than the combined expenses of the management fee and the brokerage commissions, then the tracking error becomes a negative number and would tend to cause the daily returns of the per unit NAV to underperform the daily returns of the Benchmark Oil Futures Contract. Third, USOF may hold Other Oil-Related Investments in its portfolio that may fail to closely track the Benchmark Oil Futures Contracts total return movements. In that case, the error in tracking the Benchmark Oil Futures Contract could result in daily changes in the per unit NAV of USOF that are either too high, or too low, relative to the daily changes in the Benchmark Oil Futures Contract. During the six months ended June 30, 2012, USOF did not hold any Other Oil-Related Investments. If USOF increases in size, and due to its obligations to comply with regulatory limits, USOF may invest in Other Oil-Related Investments which may have the effect of increasing transaction related expenses and may result in increased tracking error. USCF anticipates that interest rates will continue to remain at historical lows and therefore, it is anticipated that fees and expenses paid by USOF will continue to be higher than interest earned by USOF. As such, USCF anticipates that USOF will continue to underperform its benchmark until such a time when interest earned at least equals or exceeds the fees and expenses paid by USOF. Term Structure of Crude Oil Futures Prices and the Impact on Total Returns. Several factors determine the total return from investing in a futures contract position. One factor that impacts the total return that will result from investing in near month futures contracts and rolling those contracts forward each month is the price relationship between the current near month contract and the next month contract. For example, if the price of the near month contract is higher than the next month contract (a situation referred to as backwardation in the futures market), then absent any other change there is a tendency for the price of a next month contract to rise in value as it becomes the near month contract and approaches expiration. Conversely, if the price of a near month contract is lower than the next month contract (a situation referred to as contango in the futures market), then absent any other change there is a tendency for the price of a next month contract to decline in value as it becomes the near month contract and approaches expiration. As an example, assume that the price of crude oil for immediate delivery (the spot price), was $50 per barrel, and the value of a position in the near month futures contract was also $50. Over time, the price of the barrel of crude oil will fluctuate based on a number of market factors, including demand for oil relative to its supply. The value of the near month contract will likewise fluctuate in reaction to a number of market factors. If investors seek to maintain their position in a near month contract and not take delivery of the oil, every month they must sell their current near month contract as it approaches expiration and invest in the next month contract. If the futures market is in backwardation, e.g., when the expected price of crude oil in the future would be less, the investor would be buying a next month contract for a lower price than the current near month contract. Using the $50 per barrel price above to represent the front month price, the price of the next month contract could be $49 per barrel, that is, 2% cheaper than the front month contract. Hypothetically, and assuming no other changes to either prevailing crude oil prices or the price relationship between the spot price, the near month contract and the next month contract (and ignoring the impact of commission costs and the income earned on cash and/or cash equivalents), the value of the $49 next month contract would rise as it approaches expiration and becomes the new near month contract with a price of $50. In this example, the value of an investment in the second month contract would tend to rise faster than the spot price of crude oil, or fall slower. As a result, it would be possible in this hypothetical example for the spot price of crude oil to have risen 10% after some period of time, while the value of the investment in the second month futures contract would have risen 12%, assuming backwardation is large enough or enough time has elapsed. Similarly, the spot price of crude oil could have fallen 10% while the value of an investment in the futures contract could have fallen only 8%. Over time, if backwardation remained constant, the difference would continue to increase. If the futures market is in contango, the investor would be buying a next month contract for a higher price than the current near month contract. Using again the $50 per barrel price above to represent the front month price, the price of the next month contract could be $51 per barrel, that is, 2% more expensive than the front month contract. Hypothetically, and assuming no other changes to either prevailing crude oil prices or the price relationship between the spot price, the near month contract and the next month contract (and ignoring the impact of commission costs and the income earned on cash and/or cash equivalents), the value of the next month contract would fall as it approaches expiration and becomes the new near month contract with a price of $50. In this example, it would mean that the value of an investment in the second month would tend to rise slower than the spot price of crude oil, or fall faster. As a result, it would be possible in this hypothetical example for the spot price of crude oil to have risen 10% after some period of time, while the value of the investment in the second month futures contract will have risen only 8%, assuming contango is large enough or enough time has elapsed. Similarly, the spot price of crude oil could have fallen 10% while the value of an investment in the second month futures contract could have fallen 12%. Over time, if contango remained constant, the difference would continue to increase. 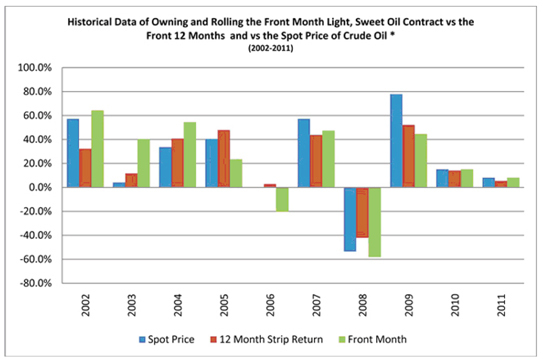 The chart below compares the price of the near month contract to the average price of the near 12 month contracts over the last 10 years (2002-2011) for light, sweet crude oil. When the price of the near month contract is higher than the average price of the near 12 month contracts, the market would be described as being in backwardation. When the price of the near month contract is lower than the average price of the near 12 month contracts, the market would be described as being in contango. Although the prices of the near month contract and the average price of the near 12 month contracts do tend to move up or down together, it can be seen that at times the near month prices are clearly higher than the average price of the near 12 month contracts (backwardation), and other times they are below the average price of the near 12 month contracts (contango). An alternative way to view the same data is to subtract the dollar price of the average dollar price of the near 12 month contracts for light, sweet crude oil from the dollar price of the near month contract for light, sweet crude oil. If the resulting number is a positive number, then the near month price is higher than the average price of the near 12 months and the market could be described as being in backwardation. If the resulting number is a negative number, then the near month price is lower than the average price of the near 12 months and the market could be described as being in contango. The chart below shows the results from subtracting the average dollar price of the near 12 month contracts from the near month price for the 10 year period between 2002 and 2011. An investment in a portfolio that involved owning only the near month contract would likely produce a different result than an investment in a portfolio that owned an equal number of each of the near 12 months worth of contracts. Generally speaking, when the crude oil futures market is in backwardation, the near month only portfolio would tend to have a higher total return than the 12 month portfolio. Conversely, if the crude oil futures market was in contango, the portfolio containing 12 months worth of contracts would tend to outperform the near month only portfolio. The chart below shows the annual results of owning a portfolio consisting of the near month contract and a portfolio containing the near 12 months worth of contracts. In addition, the chart shows the annual change in the spot price of light, sweet crude oil. In this example, each month, the near month only portfolio would sell the near month contract at expiration and buy the next month out contract. The portfolio holding an equal number of the near 12 months worth of contracts would sell the near month contract at expiration and replace it with the contract that becomes the new twelfth month contract. HYPOTHETICAL PERFORMANCE RESULTS HAVE MANY INHERENT LIMITATIONS, SOME OF WHICH ARE DESCRIBED BELOW. NO REPRESENTATION IS BEING MADE THAT USOF WILL OR IS LIKELY TO ACHIEVE PROFITS OR LOSSES SIMILAR TO THOSE SHOWN. IN FACT, THERE ARE FREQUENTLY SHARP DIFFERENCES BETWEEN HYPOTHETICAL PERFORMANCE RESULTS AND THE ACTUAL RESULTS ACHIEVED BY ANY PARTICULAR TRADING PROGRAM. ONE OF THE LIMITATIONS OF HYPOTHETICAL PERFORMANCE RESULTS IS THAT THEY ARE GENERALLY PREPARED WITH THE BENEFIT OF HINDSIGHT. IN ADDITION, HYPOTHETICAL TRADING DOES NOT INVOLVE FINANCIAL RISK, AND NO HYPOTHETICAL TRADING RECORD CAN COMPLETELY ACCOUNT FOR THE IMPACT OF FINANCIAL RISK IN ACTUAL TRADING. FOR EXAMPLE, THE ABILITY TO WITHSTAND LOSSES OR TO ADHERE TO A PARTICULAR TRADING PROGRAM IN SPITE OF TRADING LOSSES ARE MATERIAL POINTS WHICH CAN ALSO ADVERSELY AFFECT ACTUAL TRADING RESULTS. THERE ARE NUMEROUS OTHER FACTORS RELATED TO THE MARKETS IN GENERAL OR TO THE IMPLEMENTATION OF ANY SPECIFIC TRADING PROGRAM WHICH CANNOT BE FULLY ACCOUNTED FOR IN THE PREPARATION OF HYPOTHETICAL PERFORMANCE RESULTS AND ALL OF WHICH CAN ADVERSELY AFFECT ACTUAL TRADING RESULTS. BECAUSE THERE ARE NO ACTUAL TRADING RESULTS TO COMPARE TO THE HYPOTHETICAL PERFORMANCE RESULTS, INVESTORS SHOULD BE PARTICULARLY WARY OF PLACING UNDUE RELIANCE ON THESE HYPOTHETICAL PERFORMANCE RESULTS. As seen in the chart above, there have been periods of both positive and negative annual total returns for both hypothetical portfolios over the last 10 years. In addition, there have been periods during which the near month only approach had higher returns, and periods where the 12 month approach had higher total returns. The above chart does not represent the performance history of USOF or any Related Public Fund. Historically, the crude oil futures markets have experienced periods of contango and backwardation, with backwardation being in place more often than contango. During 2006 and the first half of 2007, these markets experienced contango. However, starting early in the third quarter of 2007, the crude oil futures market moved into backwardation. The crude oil markets remained in backwardation until late in the second quarter of 2008 when they moved into contango. The crude oil markets remained in contango until late in the third quarter of 2008, when the markets moved into backwardation. Early in the fourth quarter of 2008, the crude oil market moved back into contango and remained in contango for the balance of 2008. Throughout 2009, the crude oil market remained in contango. 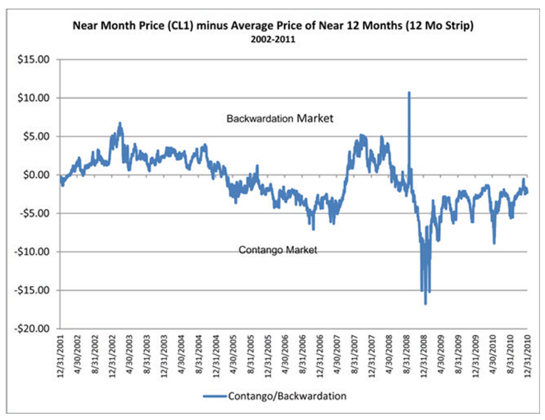 During parts of January and February 2009, the level of contango was unusually steep. Crude oil inventories, which reached historic levels in January and February 2009 and which appeared to be the primary cause of the steep level of contango, began to drop in March 2009 and continued to drop for the balance of 2009 and the beginning of 2010. The crude oil futures market remained in contango through 2010. In 2011, the crude oil futures market experienced long periods of mild contango, with the exception of a short period during the first quarter of 2011 where contango steepened by 4%. The crude oil futures market remained in contango through the six months ended June 30, 2012. Periods of contango or backwardation do not materially impact USOFs investment objective of having the daily percentage changes in its per unit NAV track the daily percentage changes in the price of the Benchmark Oil Futures Contract since the impact of backwardation and contango tend to equally impact the daily percentage changes in price of both USOFs units and the Benchmark Oil Futures Contract. It is impossible to predict with any degree of certainty whether backwardation or contango will occur in the future. It is likely that both conditions will occur during different periods. Crude Oil Market. During the six months ended June 30, 2012, crude oil prices were impacted by several factors. On the consumption side, demand moderated inside and outside the United States as global economic growth, including emerging economies such as China and India, showed signs of slowing economic growth. Europe in particular showed signs of weakness as the ongoing financial and banking crisis raised concerns during the second quarter of 2012. On the supply side, efforts to reduce production by the Organization of the Petroleum Exporting Countries (OPEC) to more closely match global consumption were partially successful. In the summer of 2011, production had been disrupted by political unrest in the Middle East, particularly Libya, which reduced global supply by approximately 1.8 million barrels per day. A partial resolution of the Libyan situation has reduced concerns regarding the global supply of crude oil. However, continuing concerns about the political standoff with Iran have left the market subject to bouts of heightened volatility as OPECs ability to replace Iranian oil currently subject to embargo is not unlimited. Crude oil prices finished the second quarter of 2012 approximately 14.03% lower than at the beginning of the year, as the global economy continues to adjust to periods of slow recovery and economic growth. USCF believes that should the global economic situation cease to improve, or decline, there is a meaningful possibility that crude oil prices could further retreat from their current levels, while any military actions involving Iran would likely have the opposite effect. Crude Oil Price Movements in Comparison to Other Energy Commodities and Investment Categories. USCF believes that investors frequently measure the degree to which prices or total returns of one investment or asset class move up or down in value in concert with another investment or asset class. Statistically, such a measure is usually done by measuring the correlation of the price movements of the two different investments or asset classes over some period of time. The correlation is scaled between 1 and -1, where 1 indicates that the two investment options move up or down in price or value together, known as positive correlation, and -1 indicates that they move in completely opposite directions, known as negative correlation. A correlation of 0 would mean that the movements of the two are neither positively nor negatively correlated, known as non-correlation. That is, the investment options sometimes move up and down together and other times move in opposite directions. 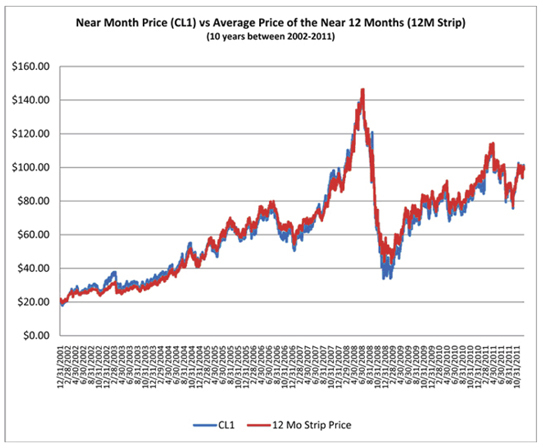 For the ten-year time period between June 30, 2002 and June 30, 2012, the chart below compares the monthly movements of crude oil prices versus the monthly movements of the prices of several other energy commodities, such as natural gas, heating oil, and unleaded gasoline, as well as several major non-commodity investment asset classes, such as large cap U.S. equities, U.S. government bonds and global equities. It can be seen that over this particular time period, the movement of crude oil on a monthly basis was not strongly correlated, positively or negatively, with the movements of large cap U.S. equities or U.S. government bonds. However, movements in crude oil had a strong positive correlation to movements in heating oil and unleaded gasoline. Finally, crude oil had a positive, yet weaker correlation with global equities and natural gas. The chart below covers a more recent, but much shorter, range of dates than the above chart. Over the one-year period ended June 30, 2012, crude oil had a strong positive correlation with domestic and global equities. The correlation of crude oil with the movements of heating oil and global and domestic equities was stronger compared to what it had displayed over the ten-year period ended June 30, 2012. Notably, the correlation between crude oil and large cap U.S. equities, which had been essentially non-correlated over the ten-year period ended June 30, 2012, displayed results that indicated that they had a strong positive correlation over this shorter time period. Unleaded gasoline and natural gas still had a positive, yet much weaker correlation during the one-year period as compared to the ten-year period ended June 30, 2012. Finally, the results showed that crude oil and U.S. government bonds, which had essentially been non-correlated for the ten-year period ended June 30, 2012, were negatively correlated over this more recent time period. Investors are cautioned that the historical price relationships between crude oil and various other energy commodities, as well as other investment asset classes, as measured by correlation may not be reliable predictors of future price movements and correlation results. The results pictured above would have been different if a different range of dates had been selected. USCF believes that crude oil has historically not demonstrated a strong correlation with equities or bonds over long periods of time. However, USCF also believes that in the future it is possible that crude oil could have long term correlation results that indicate prices of crude oil more closely track the movements of equities or bonds. In addition, USCF believes that, when measured over time periods shorter than ten years, there will always be some periods where the correlation of crude oil to equities and bonds will be either more strongly positively correlated or more strongly negatively correlated than the long term historical results suggest. The correlations between crude oil, natural gas, heating oil and gasoline are relevant because USCF endeavors to invest USOFs assets in Oil Futures Contracts and Other Oil-Related Investments so that daily changes in percentage terms in USOFs per unit NAV correlate as closely as possible with daily changes in percentage terms in the price of the Benchmark Oil Futures Contract. If certain other fuel-based commodity futures contracts do not closely correlate with the crude Oil Futures Contract, then their use could lead to greater tracking error. As noted above, USCF also believes that the changes in percentage terms in the price of the Benchmark Oil Futures Contract will closely correlate with changes in percentage terms in the spot price of light, sweet crude oil. Preparation of the condensed financial statements and related disclosures in compliance with accounting principles generally accepted in the United States of America requires the application of appropriate accounting rules and guidance, as well as the use of estimates. USOFs application of these policies involves judgments and actual results may differ from the estimates used. USCF has evaluated the nature and types of estimates that it makes in preparing USOFs condensed financial statements and related disclosures and has determined that the valuation of its investments, which are not traded on a United States or internationally recognized futures exchange (such as forward contracts and over-the-counter contracts) involves a critical accounting policy. The values which are used by USOF for its Oil Futures Contracts are provided by its commodity broker who uses market prices when available, while over-the-counter contracts are valued based on the present value of estimated future cash flows that would be received from or paid to a third party in settlement of these derivative contracts prior to their delivery date and valued on a daily basis. In addition, USOF estimates interest and dividend income on a daily basis using prevailing rates earned on its cash and cash equivalents. These estimates are adjusted to the actual amount received on a monthly basis and the difference, if any, is not considered material. USOF currently generates cash primarily from: (i) the sale of baskets consisting of 100,000 units (Creation Baskets) and (ii) income earned on Treasuries, cash and/or cash equivalents. USOF has allocated substantially all of its net assets to trading in Oil Interests. USOF invests in Oil Interests to the fullest extent possible without being leveraged or unable to satisfy its current or potential margin or collateral obligations with respect to its investments in Oil Futures Contracts and Other Oil-Related Investments. A significant portion of USOFs NAV is held in cash and cash equivalents that are used as margin and as collateral for its trading in Oil Interests. The balance of the assets is held in USOFs account at its custodian bank and in Treasuries at the FCM. Income received from USOFs money market funds and Treasuries is paid to USOF. During the six months ended June 30, 2012, USOFs expenses exceeded the income USOF earned and the cash earned from the sale of Creation Baskets and the redemption of Redemption Baskets. During the six months ended June 30, 2012, USOF was forced to use other assets to pay expenses, which could cause a drop in USOFs NAV over time. To the extent expenses exceed income, USOFs NAV will be negatively impacted. USOFs investments in Oil Interests may be subject to periods of illiquidity because of market conditions, regulatory considerations and other reasons. For example, most commodity exchanges limit the fluctuations in futures contracts prices during a single day by regulations referred to as daily limits. During a single day, no trades may be executed at prices beyond the daily limit. Once the price of a futures contract has increased or decreased by an amount equal to the daily limit, positions in the contracts can neither be taken nor liquidated unless the traders are willing to effect trades at or within the specified daily limit. Such market conditions could prevent USOF from promptly liquidating its positions in Oil Futures Contracts. During the six months ended June 30, 2012, USOF was not forced to purchase or liquidate any of its positions while daily limits were in effect; however, USOF cannot predict whether such an event may occur in the future. Since March 23, 2007, USOF has been responsible for expenses relating to: (i) management fees, (ii) brokerage fees and commissions, (iii) licensing fees for the use of intellectual property, (iv) ongoing registration expenses in connection with offers and sales of its units subsequent to the initial offering, (v) other expenses, including tax reporting costs, (vi) fees and expenses of the independent directors of USCF and (vii) other extraordinary expenses not in the ordinary course of business, while USCF has been responsible for expenses relating to the fees of USOFs Marketing Agent, Administrator and Custodian and registration expenses relating to the initial offering of units. If USCF and USOF are unsuccessful in raising sufficient funds to cover these respective expenses or in locating any other source of funding, USOF will terminate and investors may lose all or part of their investment. Trading in Oil Futures Contracts and Other Oil-Related Investments, such as forwards, involves USOF entering into contractual commitments to purchase or sell oil at a specified date in the future. The aggregate market value of the contracts will significantly exceed USOFs future cash requirements since USOF intends to close out its open positions prior to settlement. As a result, USOF is generally only subject to the risk of loss arising from the change in value of the contracts. USOF considers the fair value of its derivative instruments to be the unrealized gain or loss on the contracts. The market risk associated with USOFs commitments to purchase oil is limited to the aggregate market value of the contracts held. However, should USOF enter into a contractual commitment to sell oil, it would be required to make delivery of the oil at the contract price, repurchase the contract at prevailing prices or settle in cash. Since there are no limits on the future price of oil, the market risk to USOF could be unlimited. USOFs exposure to market risk depends on a number of factors, including the markets for oil, the volatility of interest rates and foreign exchange rates, the liquidity of the Oil Futures Contracts and Other Oil-Related Investments markets and the relationships among the contracts held by USOF. Drastic market occurrences could ultimately lead to the loss of all or substantially all of an investors capital. When USOF enters into Oil Futures Contracts and Other Oil-Related Investments, it is exposed to the credit risk that the counterparty will not be able to meet its obligations. The counterparty for the Oil Futures Contracts traded on the NYMEX and on most other futures exchanges is the clearinghouse associated with the particular exchange. In general, in addition to margin required to be posted by the clearinghouse in connection with cleared trades, clearinghouses are backed by their members who may be required to share in the financial burden resulting from the nonperformance of one of their members and, therefore, this additional member support should significantly reduce credit risk. Some foreign exchanges are not backed by their clearinghouse members but may be backed by a consortium of banks or other financial institutions. There can be no assurance that any counterparty, clearinghouse, or their members or their financial backers will satisfy their obligations to USOF in such circumstances. USCF attempts to manage the credit risk of USOF by following various trading limitations and policies. In particular, USOF generally posts margin and/or holds liquid assets that are approximately equal to the market value of its obligations to counterparties under the Oil Futures Contracts and Other Oil-Related Investments it holds. USCF has implemented procedures that include, but are not limited to, executing and clearing trades only with creditworthy parties and/or requiring the posting of collateral or margin by such parties for the benefit of USOF to limit its credit exposure. UBS Securities LLC, USOFs commodity broker, or any other broker that may be retained by USOF in the future, when acting as USOFs FCM in accepting orders to purchase or sell Oil Futures Contracts on United States exchanges, is required by CFTC regulations to separately account for and segregate as belonging to USOF, all assets of USOF relating to domestic Oil Futures Contracts trading. These FCMs are not allowed to commingle USOFs assets with their other assets. In addition, the CFTC requires commodity brokers to hold in a secure account USOFs assets related to foreign Oil Futures Contracts trading. During the six months ended June 30, 2012, the only foreign exchange on which USOF made investments was the ICE Futures, which is a London based futures exchange. Those crude oil contracts are denominated in U.S. dollars. If, in the future, USOF purchases over-the-counter contracts, see Item 3. Quantitative and Qualitative Disclosures About Market Risk in this quarterly report on Form 10-Q for a discussion of over-the-counter contracts. As of June 30, 2012, USOF held cash deposits and investments in Treasuries and money market funds in the amount of $1,324,037,877 with the custodian and FCM. Some or all of these amounts may be subject to loss should USOFs custodian and/or FCM cease operations. As of June 30, 2012, USOF had no loan guarantee, credit support or other off-balance sheet arrangements of any kind other than agreements entered into in the normal course of business, which may include indemnification provisions relating to certain risks that service providers undertake in performing services which are in the best interests of USOF. While USOFs exposure under these indemnification provisions cannot be estimated, they are not expected to have a material impact on USOFs financial position. USOF had no direct exposure to European sovereign debt as of June 30, 2012 and has no direct exposure to European sovereign debt as of the filing of this quarterly report on Form 10-Q. In order to meet its investment objective and pay its contractual obligations described below, USOF requires liquidity to redeem units, which redemptions must be in blocks of 100,000 units called Redemption Baskets. USOF has to date satisfied this obligation by paying from the cash or cash equivalents it holds or through the sale of its Treasuries in an amount proportionate to the number of units being redeemed. USOFs primary contractual obligations are with USCF. In return for its services, USCF is entitled to a management fee calculated monthly as a fixed percentage of USOFs NAV, currently 0.45% of NAV on its average daily total net assets. USCF agreed to pay the start-up costs associated with the formation of USOF, primarily its legal, accounting and other costs in connection with USCFs registration with the CFTC as a CPO and the registration and listing of USOF and its units with the SEC, FINRA and NYSE Arca (formerly, AMEX), respectively. However, since USOFs initial offering of units, offering costs incurred in connection with registering and listing additional units of USOF have been directly borne on an ongoing basis by USOF, and not by USCF. USCF pays the fees of USOFs marketing agent, ALPS Distributors, Inc., and the fees of the custodian and transfer agent, Brown Brothers Harriman & Co. (BBH&Co.), as well as BBH&Co.s fees for performing administrative services, including those in connection with the preparation of USOFs condensed financial statements and its SEC, NFA and CFTC reports. USCF and USOF have also entered into a licensing agreement with the NYMEX pursuant to which USOF and the Related Public Funds, other than USBO, USCI, CPER, USAG and USMI, pay a licensing fee to the NYMEX. USOF also pays the fees and expenses associated with its tax accounting and reporting requirements. In addition to USCFs management fee, USOF pays its brokerage fees (including fees to a FCM), over-the-counter dealer spreads, any licensing fees for the use of intellectual property, and, subsequent to the initial offering, registration and other fees paid to the SEC, FINRA, or other regulatory agencies in connection with the offer and sale of units, as well as legal, printing, accounting and other expenses associated therewith, and extraordinary expenses. The latter are expenses not incurred in the ordinary course of USOFs business, including expenses relating to the indemnification of any person against liabilities and obligations to the extent permitted by law and under the LP Agreement, the bringing or defending of actions in law or in equity or otherwise conducting litigation and incurring legal expenses and the settlement of claims and litigation. Commission payments to a FCM are on a contract-by-contract, or round turn, basis. USOF also pays a portion of the fees and expenses of the independent directors of USCF. See Note 3 to the Notes to Condensed Financial Statements (Unaudited) in Item 1 of this quarterly report on Form 10-Q. The parties cannot anticipate the amount of payments that will be required under these arrangements for future periods, as USOFs per unit NAVs and trading levels to meet its investment objective will not be known until a future date. These agreements are effective for a specific term agreed upon by the parties with an option to renew, or, in some cases, are in effect for the duration of USOFs existence. Either party may terminate these agreements earlier for certain reasons described in the agreements. As of June 30, 2012, USOFs portfolio consisted of 13,918 Crude Oil Futures CL August 2012 Contracts traded on the NYMEX and 2,000 WTI Crude Oil Futures August 2012 Contracts traded on the ICE Futures. For a list of USOFs current holdings, please see USOFs website at www.unitedstatesoilfund.com. In the future, USOF may purchase over-the-counter contracts (OTC Contracts). Unlike most exchange-traded futures contracts or exchange-traded options on such futures, each party to an OTC Contract bears the credit risk that the other party may not be able to perform its obligations under its contract. To reduce the credit risk that arises in connection with such contracts, USOF will generally enter into an agreement with each counterparty based on the Master Agreement published by ISDA that provides for the netting of its overall exposure to its counterparty, if the counterparty is unable to meet its obligations to USOF due to the occurrence of a specified event, such as the insolvency of the counterparty. USCF assesses or reviews, as appropriate, the creditworthiness of each potential or existing counterparty to an OTC Contract pursuant to guidelines approved by USCFs board of directors (the Board). Furthermore, USCF on behalf of USOF only enters into OTC Contracts with counterparties who are, or are affiliates of, (a) banks regulated by a United States federal bank regulator, (b) broker-dealers regulated by the SEC, (c) insurance companies domiciled in the United States, or (d) producers, users or traders of energy, whether or not regulated by the CFTC. Any entity acting as a counterparty shall be regulated in either the United States or the United Kingdom unless otherwise approved by the Board after consultation with its legal counsel. Existing counterparties are also reviewed periodically by USCF. USOF will also require that the counterparty be highly rated and/or provide collateral or other credit support. Even if collateral is used to reduce counterparty credit risk, sudden changes in the value of OTC transactions may leave a party open to financial risk due to a counterparty default since the collateral held may not cover a partys exposure on the transaction in such situations. In general, valuing OTC derivatives is less certain than valuing actively traded financial instruments such as exchange-traded futures contracts and securities or cleared swaps because the price and terms on which such OTC derivatives are entered into or can be terminated are individually negotiated, and those prices and terms may not reflect the best price or terms available from other sources. In addition, while market makers and dealers generally quote indicative prices or terms for entering into or terminating OTC Contracts, they typically are not contractually obligated to do so, particularly if they are not a party to the transaction. As a result, it may be difficult to obtain an independent value for an outstanding OTC derivatives transaction. During the six months ended June 30, 2012, USOF did not employ any hedging methods such as those described above since all of its investments were made over an exchange. Therefore, during such period, USOF was not exposed to counterparty risk. USOF anticipates that the use of Other Oil-Related Investments together with its investments in Oil Futures Contracts will produce price and total return results that closely track the investment goals of USOF. However, there can be no assurance of this. OTC Contracts may result in higher transaction-related expenses than the brokerage commissions paid in connection with the purchase of Oil Futures Contracts, which may impact USOFs ability to successfully track the Benchmark Oil Futures Contract. USOF maintains disclosure controls and procedures that are designed to ensure that material information required to be disclosed in USOFs periodic reports filed or submitted under the Securities Exchange Act of 1934, as amended, is recorded, processed, summarized and reported within the time period specified in the SECs rules and forms. The duly appointed officers of USCF, including its chief executive officer and chief financial officer, who perform functions equivalent to those of a principal executive officer and principal financial officer of USOF if USOF had any officers, have evaluated the effectiveness of USOFs disclosure controls and procedures and have concluded that the disclosure controls and procedures of USOF have been effective as of the end of the period covered by this quarterly report on Form 10-Q. There were no changes in USOFs internal control over financial reporting during USOFs last fiscal quarter that have materially affected, or are reasonably likely to materially affect, USOFs internal control over financial reporting. There have been no material changes to the risk factors previously disclosed in USOFs Annual Report on Form 10-K for the fiscal year ended December 31, 2011, filed on February 29, 2012, except for the addition of the risk factor set forth below. USOF is organized and operated as a limited partnership in accordance with the provisions of the LP Agreement and applicable state law, and therefore, USOF has a more complex tax treatment than traditional mutual funds. USOF is organized and operated as a limited partnership in accordance with the provisions of the LP Agreement and applicable state law. No U.S. federal income tax is paid by USOF on its income. Instead, USOF will furnish unitholders each year with tax information on IRS Schedule K-1 (Form 1065) and each U.S. unitholder is required to report on its U.S. federal income tax return its allocable share of the income, gain, loss and deduction of USOF. This must be reported without regard to the amount (if any) of cash or property the unitholder receives as a distribution from USOF during the taxable year. A unitholder, therefore, may be allocated income or gain by USOF but receive no cash distribution with which to pay the tax liability resulting from the allocation, or may receive a distribution that is insufficient to pay such liability. In addition to federal income taxes, unitholders may be subject to other taxes, such as state and local income taxes, unincorporated business taxes, business franchise taxes and estate, inheritance or intangible taxes that may be imposed by the various jurisdictions in which USOF does business or owns property or where the unitholders reside. Although an analysis of those various taxes is not presented here, each prospective unitholder should consider their potential impact on its investment in USOF. It is each unitholders responsibility to file the appropriate U.S. federal, state, local, and foreign tax returns. Pursuant to the requirement under Rule 4.22 under the Commodity Exchange Act, each month USOF publishes an account statement for its unitholders, which includes a Statement of Income (Loss) and a Statement of Changes in Net Asset Value. The account statement is furnished to the SEC on a current report on Form 8-K pursuant to Section 13 or 15(d) of the Exchange Act and posted each month on USOFs website at www.unitedstatesoilfund.com. Second Amendment Agreement to the Administrative Agency Agreement. Second Amendment Agreement to the Custodian Agreement. Certification by Principal Executive Officer Pursuant to Section 302 of the Sarbanes-Oxley Act of 2002. Certification by Principal Financial Officer Pursuant to Section 302 of the Sarbanes-Oxley Act of 2002. Pursuant to Section 906 of the Sarbanes-Oxley Act of 2002. Certification by Principal Financial Officer Pursuant to 18 U.S.C. Section 1350, as Adopted Pursuant to Section 906 of the Sarbanes-Oxley Act of 2002. XBRL Taxonomy Extension Calculation Linkbase. XBRL Taxonomy Extension Definition Linkbase. XBRL Taxonomy Extension Label Linkbase. XBRL Taxonomy Extension Presentation Linkbase. In accordance with Rule 406T of Regulation S-T, the information in these exhibits is furnished and deemed not filed or part of a registration statement or prospectus for purposes of Sections 11 or 12 of the Securities Act of 1933, is deemed not filed for purposes of Section 18 of the Securities Exchange Act of 1934, and otherwise is not subject to liability under these sections.